Chicago’s municipal flag was officially adopted April 4, 1917. It was chosen after a competition by a special commission. The designer is Wallace Rice. Its stripes are blue and white. Its stars symbolize the Great Fire and World’s Fair. The flag is white, the composite of all the colors, because Chicago’s population is a composite of all the nations. The white is divided into three parts, the uppermost signifying the North Side, the larger middle bar the great West Side, and the lowermost the South Side. The two stripes of blue signify primarily Lake Michigan and the North branch of the Chicago river above, bounding the North Side, and the South branch of the river and the great canal below. Chicago is the metropolis of Illinois, and the two blue stripes represent the Illinois stripe in the state centennial banner, doubled to indicate this supremacy and commemorating the services of the city during the civil war. On the broad white middle bar are two six-pointed stars five-pointed stars in the language of flags standing for sovereign states. That nearest the staff symbolizes the Chicago Fire of 1871, the other the World’s Columbian Exposition of 1892-3—the two great formative events in local history. Each of the points of the stars also has its significance. 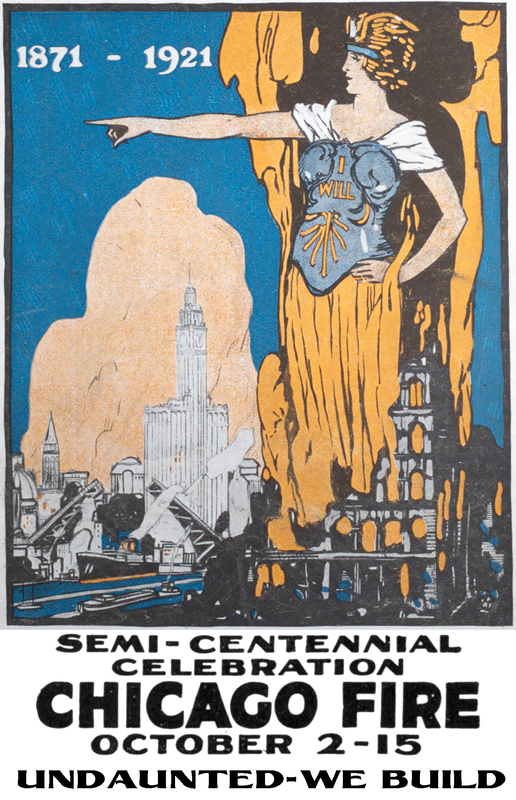 Those in the fire star stand for material ideals in which Chicago is either already preeminent or is seeking preeminence industry, transportation, finance, commerce, populousness, and salubrity or healthfulness. Similarly, those in the fair star stand for immaterial and spiritual ideals religion, the city being the seat of a Roman Catholic archdiocese, a Protestant Episcopal diocese, important governing bodies in many other denominations, and of numerous theological seminaries, education, with several universities and technical schools, innumerable primary and secondary schools, public, parochial and private, and highly important libraries and museums; esthetics, testified to by the plans for the city beautiful, Orchestra Hall and great conservatories of music, Art Institute, opera and the art clubs and similar institutions; justice, shown by the juvenile, morals and domestic relations courts, in which this city has led the world; beneficence, evinced in social settlements, playgrounds and in a hundred other ways; and civism or the civic spirit, which is the animating force behind all these, driving Chicago on to the fulfillment of its high destiny. Chicago’s flag, officially adopted by the City of Chicago in 1917, will be the central figure of the celebration of the Semi-Centennial of the Chicago Fire. The white field of the flag is divided into three bars, the two outer sections representing the North and South Sides and the center the more populous area of the West Side. The blue stripes represent the branches of the Chicago River, division lines of the city. The six-pointed red star near the staff symbolizes the Chicago fire of ’71: the other the World’s Columbian Exposition of 1892-3, the two great formative events of Chicago’s history. Compliments of and Supplement to Chicago Herald and Examiner, October 2, 1921. 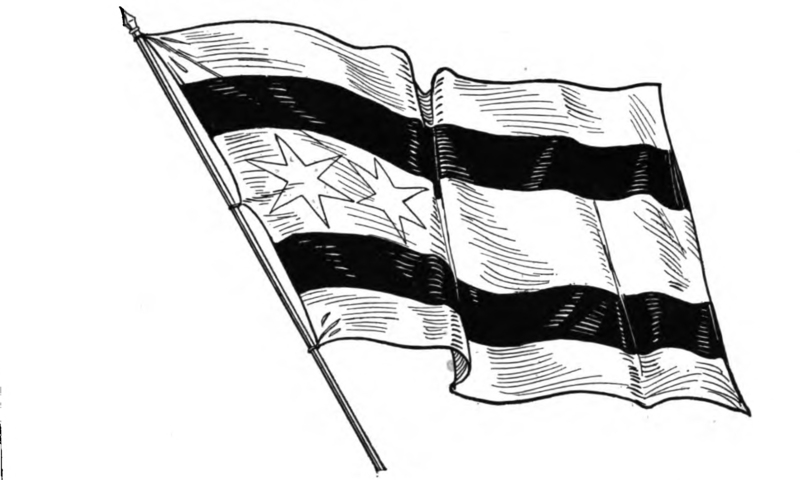 Kitty Kelly is shown here displaying the official Chicago flag which will form the keynote of decorations during the Chicago fire semi-centennial celebration. 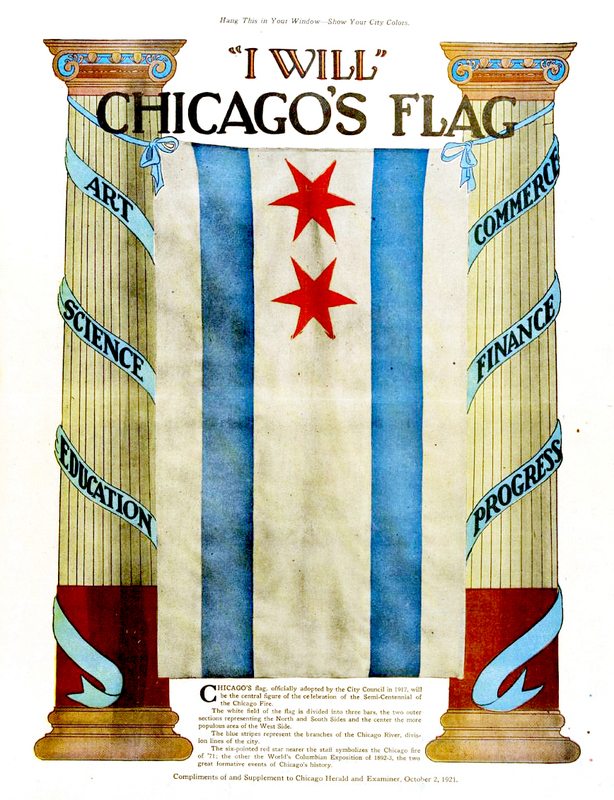 The Chicago flag, adapted by the city council in 1917, was designed by Wallard Rice, author of the festival play which will be given in Grant Park as the chief feature of the Chicago fire semi-centennial, Oct. 2-15.
Business houses and individuals will be asked by the decorations committee to use this flag as the central figure in the decorations. The flag has gained two more stars and their positions have been adjusted in order for the stars to be in chronological order. The third star symbolizes the World’s Columbian Exposition of 1893, and is original to the 1917 design. Its six points stand for political entities Chicago has belonged to and the flags that have flown over the area: France 1693, Great Britain 1763, Virginia 1778, the Northwest Territory 1798, Indiana Territory 1802, and Illinois 1818. After more than four hundred designs had been made by me, I finally struck upon such a six-pointed star as had never appeared in any flag before, peculiarly and singularly a Chicago star, made by a Chicagoan for his greatly loved city, by an American in the tenth generation in this country, whose ancestors had fought against Great Britain, for the most American of American cities. It differs from all other stars in use in European heraldry and in State and National flags and coats-of-arms, and is specifically for and of Chicago and nowhere else on earth because its points are straight and not like the usual heraldric etoile curved like flames, and because these points subtend an angle of only thirty degrees, instead of the sixty degrees subtended in the star made by superimposing a triangle.